As Jim spoke, he turned the station wagon into the driveway of Crabapple Farm. He put the car in park and turned around in the seat, looking Trixie directly in the eye as he continued: "If you decide to do something about your theory without telling anyone else, that is not all right. If you get into trouble, someone else had better know enough about what's going on to help you out of it. Understand?" Trixie sat motionless, frozen by Jim's sincere gaze. Finally she looked down at her hands in her lap and nodded. "We'd already decided not to do anything about our theory until we have some more information, Jim," Honey said. "Okay," Jim said. "Now, everybody give me your lists of donors so I can make the pickup rounds tonight with the wagon." Mart and Honey handed over thier lists. Trixie contined to state at her hands, trying to convince herself that Jim had lectured her out of concern for her safety. It was true, she had to admit, that she and Honey had both had close calls when they plunged into action without telling anybody about it. Jim had a point, she finally concluded. "C-Could I ride along tonight when you go to pick up things for the sale?" she asked timidly. Jim grinned at her. "Sure can," he said. "I can't think of anyone else I'd rather be with tonight. Remember, though, that we're in for a lot of hard work and not a relaxing movie," he warned her with a mock grimace. Trixie felt the knot in her stomach begin to relax. It was important, she knew, that she not allow herself to avoid Jim, letting her anger grow and turning his concerned warning into an unfeeling lecture in her mind. 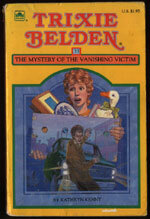 The ghost writer of this book is thought to be Carl Henry Rathjen. The Bob-Whites attract attention when they are given a Model T Ford to auction for the Hospital rummage sale, and are helped by a stranger when the car breaks down. When the stranger is run down by a van before their eyes, Trixie becomes determined to find out who is responsible. 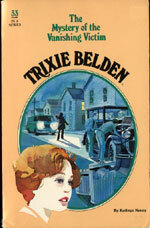 But the victim can't even remember his own name, and when he disappears and the Model T is vandalised, Trixie is the only one who believes he is innocent and vows to solve the mystery and find the vanishing victim. Andy Kowalski - was Henry's janitor and tried to steal his invention and then lied successfully in court to have him jailed. Kowalski ran Henry down on the street and tried to blackmail him to get his invention. This book takes place in the early summer (p. 43). The most obvious inconsistency in this book is in the following quote: 'Mr Lytell would never have gotten his money back that time if you hadn't listened' (p. 56). The only event this could possibly refer to happens in the next book, The Mystery of the Missing Millionaire. The books are written by different authors, so they must have originally intended to be published in reverse order. Rathjen must have read French's manuscript to be able to refer to this book. #34 is set in August which is after the events in this book, but something is obviously out of sequence. Trixie has no trouble using a word like 'analogy' correctly (p. 70), but she struggles with a word like 'hostile' (p. 140).